Michelle has a Bachelor of Science degree in Mathematics, MBA from Pepperdine University and Juris Doctor degree from Loyola Law School, Los Angeles, with concentration in employment and immigration law. 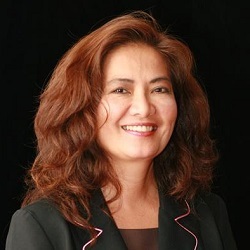 She is a licensed attorney in the State of Hawaii and comes to HPU with over 12 years of solid business management and operations background in senior executive positions for large for-profit, private and public companies based in Los Angeles, California. She also has over 8 years of management consulting in Hawaii. Michelle Alarcon served as an Executive Officer and Senior Vice President of Human Resources for ARV, Inc., a publicly traded company operating in 30 states and over 40 properties. Prior to ARV, she served as Vice-President of HR and Organizational Development for Pallotta Teamworks, the largest fundraising organization in the U.S. operating in 20 states. Michelle worked in senior HR management positions for major Hollywood and hospitality organizations based in Beverly Hills, California, including Metro-Goldwyn-Mayer and Pathe Communications Corp. where she headed the H.R. Department for this parent company and its multiple subsidiaries, Canon Pictures, Pathe Films, Pathe International, Renta Corp., Interfly, and Roma Trastevere. Pathe eventually acquired Metro-Goldwyn-Mayer. Thereafter, she served as Director and senior executive of HR for Imperial Hotels Corp., one of MGM’s major subsidiaries with over 10,000 employees nationwide. Michelle also consulted for 20th Century Fox where she helped establish SESLA, Fox, Inc, its first division in Miami, Florida, in collaboration with British Broadcasting Company executives. Michelle also taught for other universities including Chapman University, Cornell University online division, and Concord Law School. Michelle has recieved the "Best Paper" Award for her two-part publication, "Framework For Change In The Federal Trade Commission Act, Section 5", as well.